Discussion in 'Guitars in General' started by Bluewail, May 18, 2008. Over the years I've owned a lot of guitars and a few PRS guitars. While the PRS workmanship and playability were alway superb, none of them ever had the mojo, you know that vibe that makes you not want to put a guitar down. Kinda' sterile for me at least. That is until the first time I played a McSoapy. I was floored by it. The second time I played it, I bought it. Tele's are usually my axe of choice these days and the McSoapy has that single coil punch but just more - fat with no loss of clarity. The neck pup is really warm without being muddy at all and the bridge pup just growls. I had already decided I don't like Duncan soapbars but they sure work in this axe. My favorite position, both pups on, sounds extraordinary. I was sitting learning Robben's riffs from MaryAnn and it coped that clean tone to a "T". None of my tele's can (Nocaster, K-line, Suhr - the K-line comes the closest). The wrap tail piece intonates on the money and it seems like it adds to the guitars ring. Pretty light too, barely 8 lbs. I know it's still a honeymoon phase but damn so far, this is a great axe. I agree.....I had a McCarty Trem Soapbar and it was a great great sounding guitar. My only complaint was the 60 cylce hum. I love the sound of P-90's , but the hum in a live setting under gain just drives me nuts. I tried noise canceling pu's and the guitar just lost that growl and sweetness. Enjoy!!! 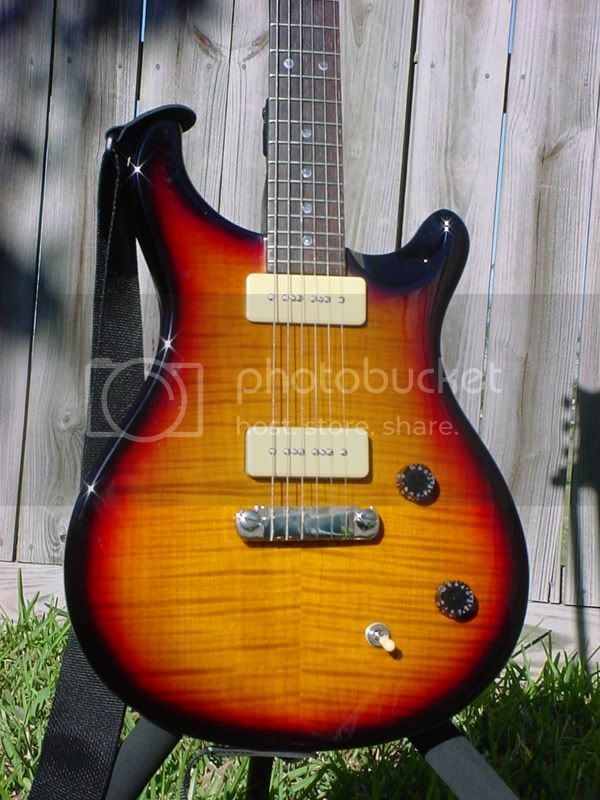 The only PRS model I've ever owned was the CU22 Soapbar. I'd love to try out a McCarty Soapbar Trem someday, but they're even rarer than the CU22 Soapies! So last night was the maiden voyage for McSoapy. Running through a '66 Deluxe Reverb and using a Timmy or Zendrive up front it just sang!! As Mr Nicholson said "it makes me want to be a better player". Very inspiring axe indeed. Note that there are several flavors.....the maple capped version, the standard solid mahogany (my fav to date), and the new Korina (hope to hear soon once Paul can ship Braz boards again). Mine is the maple cap version with the wide/fat neck in my favorite color, black. Are the McCarty Soapbars "weight -relieved"? Both this one and the McCarty with HB's I used to own are pretty light. I have a CU22 that sounds great but the mcsoapy standard is outstanding, is possibly my best P-90 guitar, I have it on storage for a while, I though about selling it, remove the rust, put new strings and tried it with several amps and found out that in every amp was sounding great. It is one of those guitars that actually complement any amp I was playing through... so I decided that it will not be going anywere and now I keep it out of storage... just love it! I tried to find a PRS for years that I liked. Never got on with the 24's, but ended up with a Custom 22, I liked the wide fat neck. 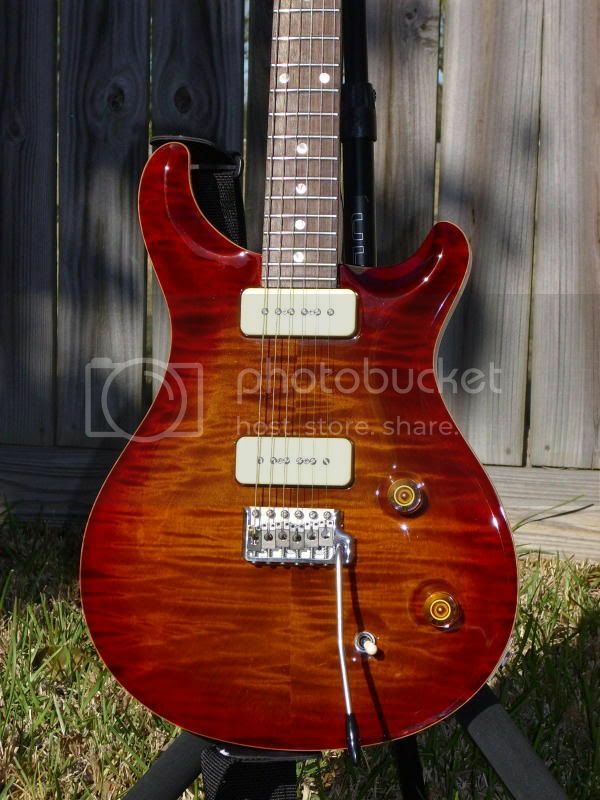 My dealer then rang me and said he had a Mcarty 22 with soapbars, and a rosewood neck (I think these have been discussed here before) anyway it blew me away. 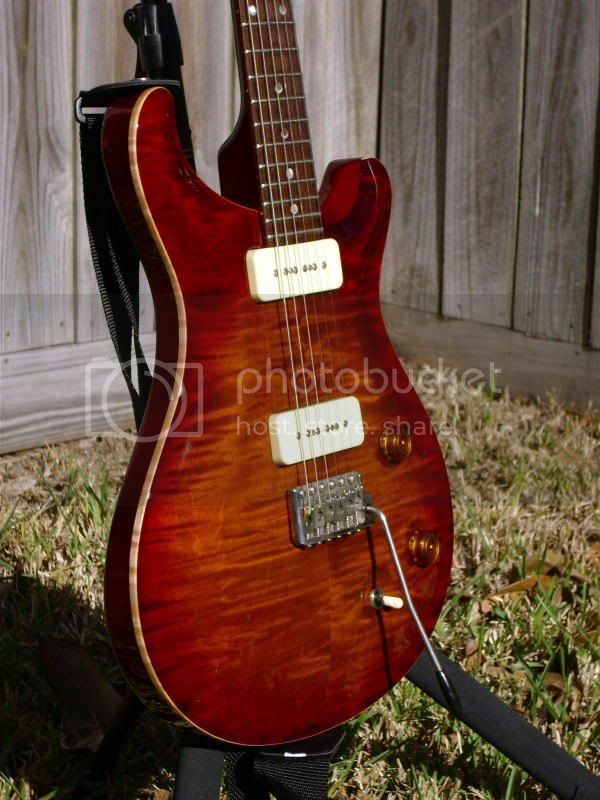 Sold the Custom 22, and still have it 9 years later, still the best PRS I have ever played. 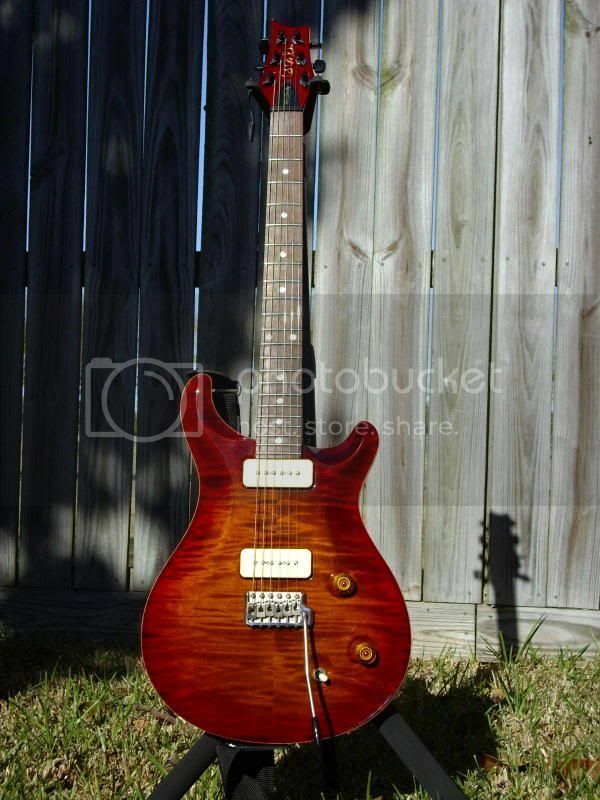 I have a McCarty Standard Soapbar with an Indian Rosewood neck. This is a very good combination of wood and electronics. One of the original batch of 26 made. I had one, loved the tone and neck but it was heavy and the body countour where my right arm hit was uncomfortable so I sold it. Great guitar though. Here's the one 02Singlecut is talkin' about. I bought her off of him and love her, on a very regular basis. This guitar smokes! Blue Wail: I'm another bay area fan of the mcSoapy. Mine has a vintage natural top (Maple cap like yours). It's the best PRS I've played, though I find the neck pu a but muffly. Small complaint thought - I usually play it in the middle pup position like you do. I think the IRW Soapbar Standard is a great guitar. Slab of mahogany, coupla' P 90s with a rosewood neck. TONE! I only sold mine because I had a custom build. I still miss a bit, though.